In this post we are going to describe two alternative solutions to the quarantine challenge from the Confidence 2015 Teaser organized by DragonSector. This was a very interesting challenge, and even though it took dreyer and me a looong time to solve it I really enjoyed working on it. The developers of this service think they have found a way to automatically thwart all memory corruption attacks. Can you prove them wrong? The service is running at 134.213.135.43:10000. The quarantine file is the main binary, which uses the vm.so file to interpret brainfuck programs. When we load the binary into IDA, we see that it has been compiled with AddressSanitizer (or ASAN), which is what the challenge description refers to when it says "a way to automatically thwart all memory corruption attacks." Let's move on with the analysis. The main binary listens on a given port (passed as a parameter on the command line) and forks for each client. This means that ASLR is not such a big deal, since the addresses will remain constant for each client and we can reuse leaks from ASAN's error reporting for our exploit. add:    Adds a new virtual machine. remove: Removes a virtual machine. change: Changes the virtual machine program. select: Selects a virtual machine to use. run:    Starts the execution of a virtual machine. Since the developers of this system think they do not need to care about memory corruption due to the use of ASAN, the code is full of bugs. Additionally, if we look at the main command handler in the binary we find a hidden give_me_the_flag command. The function handling this command opens the flag.txt file, reads it into a global buffer and outputs it using printf. When analyzing the code in the main binary, we find that the program keeps a linked list of VMs. The linked list starts at the first_vm global symbol, and VMs are always added at the front of the list. When a VM is removed, the code goes through the list of VMs until it finds the right VM and frees it. However, if the VM is not the first_vm the code forgets to check whether current_vm points to it or not. Therefore, if we select a VM (other than first_vm, i.e. the last added VM) and then remove it, we get a dangling pointer as the current_vm. If we manage to reallocate this memory, we would have a VM structure totally under control. Before we move on, we also need to understand the data structure used to keep track of the VMs and how they are used. We can do that by looking at the code initializing VMs in the main binary or by looking at the vm.so code. I found it easier to look at the vm.so code since it is not so cluttered with ASAN's stuff. Thus, it takes the array pointer and zeroes it out. Next, it enters a loop of processing instructions. A bounds check of the array pointer is performed, and if it fails an error is printed, the VM is reset and the program exits. If the array pointer is within bounds, the code parses the command at the current program counter and executes it. Note that if a loop is found ([ or ]), the code also performs a search for the matching bracket and prints an error if it cannot find it. These error prints are performed using printf, which will become important in our solution later on ;-). So now we have an idea of what our dangling pointer will be used for: to zero out a piece of data, run a brainfuck program using this data as the brainfuck VM memory, and finally zero it out again before returning. Now we need to figure out how to exploit a Use-After-Free in presence of ASAN. During the CTF, we had no idea on how ASAN worked internally, so we started looking around in Google. One of the key resources was this post from Scarybeast. In this post, a C program is provided that will trigger a use-after-free without ASAN noticing it. The code is based on allocating and freeing a lot of memory in order to achieve a reallocation of the freed chunk. After some experiments, we figured that our local machine with the default configuration required a value of 300 for the loop variable in order to trigger the re-allocation of the removed VM. For the remote machine a value of 60 worked well during the CTF. When run with ASAN_OPTIONS=quarantine_size=16777216 on my local machine, the binary behaves similarly to the remote server. So if you want to test the exploits below, you can use these settings. The way the ASAN UaF detection system works is based on introducing a quarantine zone where freed chunks are kept for a while. The quarantine zone is only freed after a certain amount of memory has been placed into it (similar to Microsoft's delayed free in Internet Explorer). The hope is that with this approach, use-after-free conditions will be easily caught during fuzzing/testing since it is unlikely that so much memory is freed and reallocated before the reuse of the dangling pointer. Anyway, with the above code (in particular with the freeing of big amounts of data) we managed to evict the target chunk from the quarantine and get it allocated again. So now it's time to move on and exploit this bug! So let's first discuss our own solution, and then discuss the intended challenge solution. Our own solution was to use the UaF to get overwrite some arbitrary memory and get a shell. Array pointer: quarantine+0x4FE328, which is the address of the real_vprintf symbol above. Then, the brainfuck program will perform a series of ", >" commands. This will read from standard input using getchar, write it over the target symbol and increment the data pointer. With this we can control the value of the real_vprintf hook. The next step is actually triggering the call without exiting the VM. If we exit the VM, the data will be zeroed so we'll crash with a null pointer exception. But since our VM interpreter calls printf on error conditions, we just need to trigger one! What we did was adding a bunch of [ at the end of the VM program, such that the loops were out of balance and printf would be called. The final question is what to overwrite real_vprintf with. Our first attempt was to use the give_flag() address, since the code already reads the flag and prints it out. Unfortunately, it does so via printf and this results in an infinite recursion... so we turned into executing a shell. .text:0000000000046533                 lea     rdi, aBinSh     ; "/bin/sh"
print "[*] Performing initial allocations"
print "[*] Creating UAF condition"
print "[*] Freeing enough memory..."
print "[*] Triggering shell! " print "[*] Everything ok! Dropping into shell." [*] Everything ok! Dropping into shell. It turns out the intended solution was actually slightly easier than our solution. ASAN works by keeping a shadow memory region in which it keeps track of the state of different memory areas. When it finds a problem, it reports where the fault originated and what the associated shadow region is. This tells us that if we zero out the bytes starting at 0x100079681c49 (shadow1 in my exploit) we should not trigger this detection and we should be able to call this command. As we know, we can do that by pointing the array space of the fake VM structure to this address and then running the VM. SUMMARY: AddressSanitizer: global-buffer-overflow ?? :0 ?? print "[*] Zeroing shadow memory for stack buffer"
print "[*] Replacing program "
print "[*] Zeroing shadow memory for global buffer"
This vulnerability was published recently (CVE-2013-2028) and it seems that many exploiters got stuck because the socket will not block because the buffer is longer than the standard ethernet MTU, some others have found another attack vector without that problem. When packets arriving at the TCP layer are analyzed and once determined the sequence are immediately delivered to the upper layer of the OSI model. If the size of the data is bigger than the MTU, is then splitted into multiple packages. The destination processes the information on many smaller packages instead of one. In summary,a single read()/recv() doesn't get all the data it asked for and the overflow will not happen. And that's what's happening on ngingx. What we have done to prevent that packets are delivered directly to the next layer is taking profit of TCP windows and TCP reorder: sending the first data packet on the last place. What happens is that the TCP stack will not deliver the packets to the next layer because the information is not complete, and just wait until all information (up to the size of the tcp window) is received to deliver it. Then the application layer will get all the information in _the same_ read and the overflow will happen. Using that TCP trick, the size limitation of the overflow is the TCP window size instead the MTU. # Just DROP the packet and the local TCP stack will send it again because won't get the ACK. Here is another PlaidCTF write-up, in this case for a challenge that we didn't solve but had almost finished by the time the CTF ended (except for a couple (mostly stupid) things I'll mention later on). In this case it was kavihk, which was a binary worth 400 points. In the archive we can see both the kavihk binary and the source code it is based on, avih. Avih "is a roguelike game whose source code fits in exactly 1024 bytes". So as you can imagine, the C code itself looks awful... everything in one line, abusing macro's, etc. So it seems the buffer at 0x0804CAD0 is actually our (30 bytes long) flag, but it is XORed with something that comes out of the function at 0x0804A1A5. The flag contains a few underscores and ends in a null byte, and this format is used to sanity check the result of the XOR before printing it. If the sanity check doesn't pass, then we are told we won the game, but there is no flag for us :(. Based on these observations, patching the game to win it won't work. We'll need to reverse further and understand how the XOR key is generated. For this, I tracked cross-references to 'unk_0x80549C0' and found that only three functions use it: the main function, a function that's called in main during initialization, and the function that checks the flag. I dove into the other two sub-functions, and saw they were initializing some global arrays... but I didn't really attempt to understand them yet. I wanted to get a bigger picture of what is going on before diving into the details. So I called this function 'init_state', noted the 1600 magic (together with the 34 and 1566 passed into it) and went on to the next function. At this point I first followed the actual game logic and compared all variables with the commented avih source code we were given. This allowed me to find out that the values passed to sub_804A1A5 actually contain the current level, the maximum health points our character can have at this moment, and the amount of gold collected so far. This seems to indicate that we'll have to 'play' one specific game (i.e. collecting the right amount of gold, right amount of talismans at each level) so we can get the key. Before I went on with that, I first wanted to understand what it was that it was using for generating the XOR key... so I dove into sub_804A1A5, which I now call do_sha3. So at this point I just decided to google for cryptographic functions (I thought it was likely to be a hash) that contained a permutation, lanes and blocks called theta, rho, pi, chi, iota. This search leads very fast to Keccak, or SHA-3 (notice the k's in the same place as the challenge name? :) ). So we have levels 0 to 9. In the level initialization function, we find that the level starts at 0 but is increased during initialization. Thus, the level value is 1-8 while we play the game, and is 9 when we have won. Allright...next question: how many dollar signs and how many talisman signs can we find at each level? For this we need to go to the level initialization code again. I reversed this function quite a bit, comparing with the original code, so I knew that there is a function to fill in random empty spots, and an array with elements used to fill in the game grid. if ( 2 * current_level <= b_tmp_var )       // 2*level monsters! This tells us that there are two dollar signs and two talismans (the ` sign) in each level. So now we have all the information required to solve the level... except for implementing the proper flavor of SHA3. It turns out this costed me quite some time, and several stupid mistakes were made during that time (yes... after ~40 hours of CTF my mind is not in a very fresh state anymore :( ). I first downloaded a python reference implementation from the Keccak website... but soon found out that the 34 and 1566 values (rate and capacity) were not supported by it (they had to be multiples of 8). So I moved into the C reference implementation... and found there was A LOT of code and it was very confusing to me at that moment. From this code, I implemented a brute-forcer to go through the options... but it turned out to be awfully slow (specially within a single-core VM where I couldn't really paralellize anything). This means we need a faster implementation... so I had to dive into the damn Keccak reference code in C.
Now, during the CTF I couldn't find the exact functions that our binary was using, so I used lower level functions and made wrappers around them to look like the ones in the binary. However, I failed at restoring the encrypted flag and also I failed at the number of iterations through the levels. It turns out that, although there are only 8 levels that the user plays, the level initialization routine is called 9 times. This means that the sha3 over the current_level, max_health_points and gold_collected is performed 9 times, not 8. Yes, in the code above it looks ok. But no, in my bruteforcer I failed to do it and set it to 8 (shame on me! ), which is one of the reasons it failed during the CTF. During the CTF I asked a couple stupid questions to clockish (who created the challenge) to check that I was still relatively sane... when the CTF ended. At this point, he told me I should have used the 'Duplex' functions from Keccak, which are exactly the ones used in the game! Even then, I had failed at the number of iterations through the loop, and also at memcpy'ing over the global flag (shame on me again! I do too much AES stuff with 16 byte blocks at work, so I used 16 b ytes in the memcpy instead of 30...). Anyway, after the CTF I had some time to fix the problems, and I got to the solution. Although this challenge was given a score of only 200 points, nobody solved it during or after the PlaidCTF contest, so I decided to give it a chance as a personal challenge, because I saw it very interesting from a technical point of view. "Top operative laser mic'd a room where a robot conspirator was logging into the robot government's secret interface. We were able to clean up the audio file significantly, but have no clue anymore." The challenge is supposed to be very straightforward, because we only have a recorded audio file of someone typing in a keyboard. Assuming that each key emits a different sound when pressed, if we have enough keystrokes, theoretically we should be able to infer the text being typed, making some assumptions (like the expected language and so on). After listening carefully to the 6 minutes of the audio file, and given the general quality of the challenges, we can safely assume that other approaches (like steganography or guessing) have to be much less probable. Instead of applying a formal method, I started writing some code and testing with some variations and I decided to follow that empirical way, keeping the process as simple as possible, so probably some part of my process is unnecessary or even have a negative impact on the final results or accuracy. 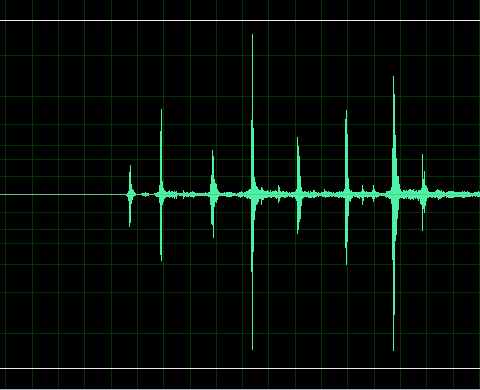 Well, my first step was to clean the audio, reducing the background noise and randomness of the signal, mainly by filtering and minimizing the lowest frequencies. 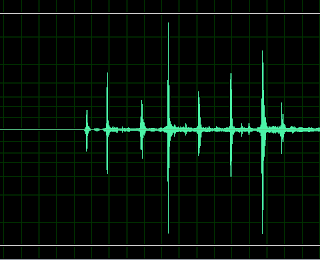 Then, I saved this filtered audio as raw PCM data (44100 Hz, 16 bits, mono), instead of the compressed MP3 format of the original file, so now we have the signal directly represented as a byte array, which is a necessary step in order to perform calculations over it. Each sound can be decomposed as a sum of frequencies, and a well-known mathematical operation to get those frequencies from its time representation is the Fourier transform. Our input is sampled data in time domain, so we will use the Discrete Fourier Transform (DFT) to transform it to the frequency domain. We can try to detect the beginning of each keystroke based on the amplitude of the signal, and then start taking samples from these points, but I decided to start with a simpler approach, dividing uniformly the whole signal in blocks of the same size, and calculate its DFT. I chose a window size of 2048 samples (46 ms) because in average is big enough to fit a whole keystroke alone (without overlapping with the closest ones), so we will have to compute the DTF of 3840 blocks in total. The DTF function will output a sequence of complex numbers, but for our purposes of spectral analysis, we can simplify and take their magnitude as a valid measure, so we will use an array of integers to hold each DFT. Once we have the DFT of each block, we can try to determine if it contains the sound of a keystroke or not by estimating the energy or power of the signal and checking if it's greater than a threshold. For instance, this can be done by summing the squares of each value. After getting rid of the silence blocks, I simplified each remaining DFT again by calculating the average of each 16 values (so the final length of the DFT arrays will be 64), trying to minimize the impact of the noise and randomness. 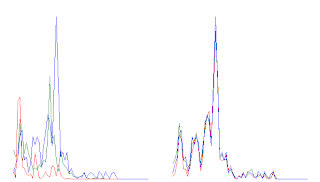 Well, as we might expect, we can clearly appreciate the difference between the graphs of the presumably different keystrokes (on the left), and the similarities of the keystrokes that appear to be originated by the same key (on the right). 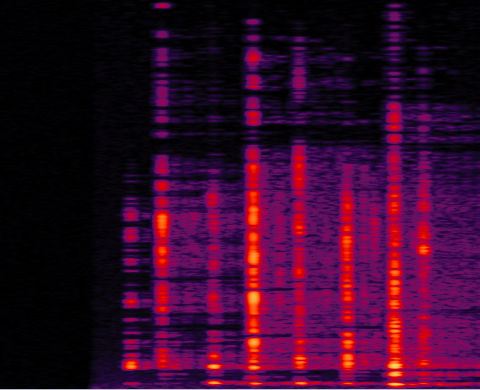 The results are quite impressive, because the consecutive samples sound almost identically, and at the same time we can clearly see that they are also sorted by energy, so the first ones are more likely to be echoes rather than being keystrokes. 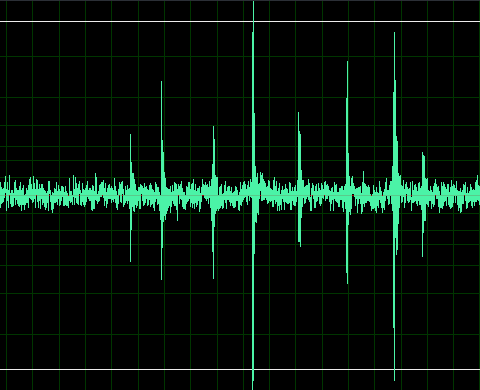 The last step involving the audio data is to group and tag all the samples. 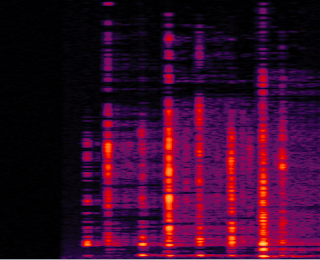 There are a lot of IA algorithms to classify a group of samples, but again, I decided to choose one of the simplest ones: scrolling the spectral view of the sorted samples manually and writing down in a paper the exact instants when the frequencies changes substantially (it could be done visually and aided by the sound itself). 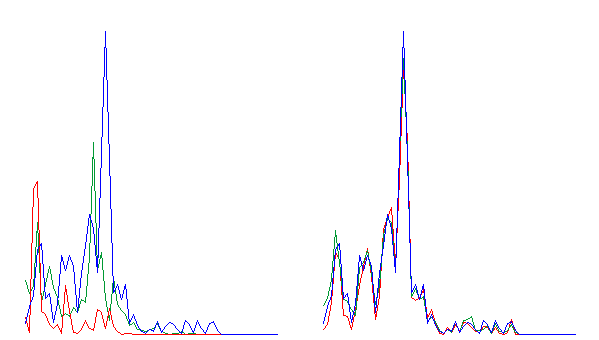 In the transition zone between a group and the next one, sometimes we'll find some samples which aren't clearly belonging to the first or the second group, but the error rate should be small in any case, and should not affect the global recovery of the text, because we have a lot of samples compared with the number of groups. In my implementation, the algorithm detected 1993 positive samples, and then I classified them in 42 different groups (much more than the expected 26 letters of the alphabet plus the space bar, carriage return and some punctuation signs). There are many reasons to justify this fact, but let's continue with the process and they'll be explained later. In my opinion, a real keyboard won't produce so many different and distinguishable sounds, like the keys of a piano, but most keys have to sound almost identically. 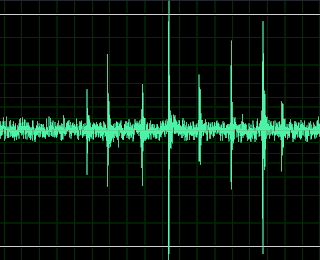 At this point, we can suspect that the audio file isn't a real recording, so if it's specifically generated to be solvable, there could be a chance that each sound has some direct relationship with its ASCII code or something, but I didn't found any. In a real scenario, the process should require more complex methods and algorithms, involving accurate cepstrums, training, probabilities, Markov chains, neural networks and so on, but in our case we will be tagging each group sequentially (for instance, starting with the labels "a", "b", "c"…), and then sort them again according to the original positions of each sample. After that process, we will have a text cryptogram ready to be solved. I started replacing the labeling the biggest groups, assuming that they have to be the space bar or the letter "e" (the most frequent keys in English), checking if the cryptogram is still consistent with the expected average word lengths. After that, I continued analyzing and replacing the most common or unusual word patterns, for instance, assuming that the ones of 3 letters have to be words like "the" or "are", the ones of 5 or 6 letters that matches with "robot" and "robots", or the almost unique pattern of the word "effective" (which appears 3 times in the text). Finally, after replacing most of the letters, we have a lot of readable phrases, and we can infer new conclusions. The most important conclusion is that some special keys (like shift or enter) are actually emitting multiple and different sounds when pressed and when released. We can see it clearly at the beginning of the phrases, because they are starting with an uppercase letter. By the way, although we can read most of the text, this detail will be crucial to solve the challenge, as we will see. ^L-UCKILY, WE HA.E A SECRET WEAPOH. ^Y-OU. ^H^ACKERS. OVERCOME OUR ROBOT ENEMIES AND DESTROY THEBR EIL REIGN. ^W-E ARE C-UNTING ON YOUR HELPW GOOD LUCK. Well, we can see that the recovered text was not perfect (probably because I simplified excessively the process), but it's highly readable and I stopped there, although with some refinements the algorithm probably could perform better. The original text was taken mainly from the synopsis of the PlaidCTF, and the flag seems to be one of the sentences at the beginning. My first attempt on the scoring panel would have been: "My keystrokes are FAR too loud", so I contacted the organizers explaining what I did and they told me that I was close, but it wasn't the correct flag (and revealed me the right one). According to the organizers, this was literally the original text (and they used a script to generate the audio file). In this case, the "^" symbol represents a pause. must make one last stand against them for all of humanity. and have been quite successful in raiding our diamond storage facilities. Luckily, we have a secret weapon. You. Hackers. find the sequence, and we can cause the robot to self destruct. overcome our robot enemies and destroy their evil reign. We are counting on your help, good luck. When I saw the angle brackets on the flag, I thought that they were emphasizing the wrong word in my expected flag, but no, they weren't… these symbols are actually part of the flag! Initially, I argued them that it was impossible to determine that symbols of the flag, as they weren't used in any other part of the text, but they replied to me that the angle brackets, in the American keyboard layouts, are the same keys (and sounds) of comma and dot, combined with the shift key. So yes, they're right and I completely agree, but I didn't noticed that, mainly because in my Spanish keyboard (and many others) these symbols are sharing the same key, so they are in a different location, and also, in the text I recovered, the process missed and confused some keystrokes.